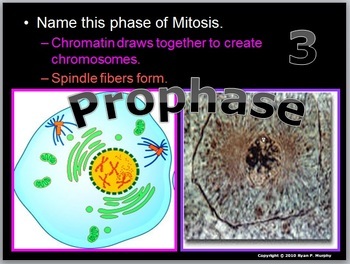 This is a PowerPoint Review Game for my DNA and Genetics Unit (as well as cell division and cancer) that I offer on TpT which includes a six part 3,500 slide PowerPoint roadmap, bundled homework package, videos, unit notes, and much more. Also included is the bundled homework package, unit notes, and PowerPoint Freebies. 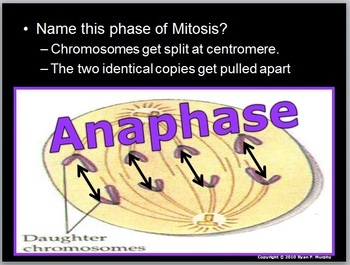 Answers in the review game are... Mitosis, Chromosomes, Prophase, Interphase, Metaphase, Spindle Fibers, Prometaphase, Telophase, Anaphase, Cytokinesis, Don't Smoke, ABCDE's of Skin Cancer, Avoid UV Exposure, Chemicals in a Cigarette, Sperm and Egg, Meiosis, Reduction, Crossing Over / Homologous Recombination, Haploid and Diploid. 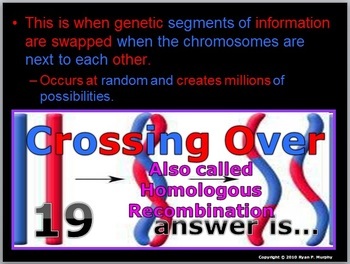 This is a PowerPoint review game (120 Slides) that contains 20 questions associated with DNA and Genetics Topics. The last five questions are fun bonus questions that have the students guess siblings / parents of famous people. A final question allows the students to wager 5 pts. This game looks a lot like Jeop_ _ _ _ but should be played differently. I break the class into six groups and let the students use their notebook and work together in small groups answering the questions one at time through the slideshow. After all the questions have been covered, the answer version is then provided so students can self assess. Each question is previewed before the answer is revealed so the teacher can call upon students or table groups. Most every question has a visual component. This is a very technical review game and each question may have multiple components. The DNA and Genetics Unit covers science topics associated with the DNA molecule, discovery of DNA, DNA's structure, cellular division, cancer, dangers of smoking, meiosis, and genetics. This unit includes a three part interactive and engaging PowerPoint Presentation of 1650+ slides with built in class notes (Red Slides), lab activities, project ideas, discussion questions, assessments (Quiz Wiz), challenge questions with answers, videos, and much more. Text is in large print (32 font) and is placed at the top of each slide so it can seen and read from all angles of a classroom. A shade technique and color coded text helps to increase student focus and allows the teacher to control the pace of the lesson. The entire unit except for the videos can be edited to fit any curriculum or time requirement. Also included is a 12 page assessment that chronologically goes with the slideshow for nightly homework, as well as an 8 page modified homework. 13 pages of class notes with images are also included for students who require modifications, as well as answer keys to both of the assessments for support professionals, teachers, and homeschool parents. 13 video shorts (.flv files) are provided and a slide within the slideshow cues teacher / parent when the videos are most relevant to play. An additional folder of 23 the best anti-tobacco advertisements is provided. Video shorts usually range from 2-7 minutes and are included in organized folders. One PowerPoint review game is included (125+ slides). 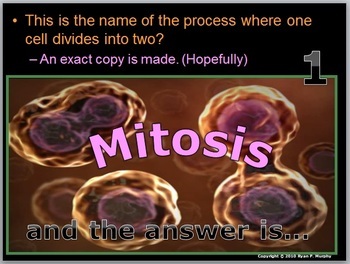 Answers to the PowerPoint review game are provided in PowerPoint form so students can self-assess. Lastly, several class games such as guess the hidden picture beneath the boxes, and the find the hidden owl somewhere within the slideshow are provided. Difficulty rating 9/10. -Areas of Focus within The DNA and Genetics Unit: DNA, DNA Extraction, Structure of DNA, Discovery of the Double Helix, Rosalind Franklin, Nucleotides, RNA, Cell Division, Mitosis, Phases of Mitosis, Chromosomes, Cancer, Ways to Avoid Cancer, What's Inside a Cigarette?, Facts about Smoking?, Anti-Smoking Ads,Meiosis, Phases in Meiosis, Mendelian Genetics, Gregor Mendel, Punnett Squares, Probability, Dihybrid Crosses, Codominance, Bio-Ethics, Stem Cell Debate, Cloning Debate. I also sell all 20 Middle-Level Science Units as a digital hard good on TpT. This includes all 20 units (50,000 slides), in Life, Earth, and Physical Science for students in grades 5-10, This also includes 275 pages of bundled homework / assessment that chronologically follows each unit, 175 pages of modified assessments, 325 pages of answer keys, 260 pages of unit notes, 37 PowerPoint review games (5000+ slides), 315 videos, hundreds of pages of handouts, First Day PowerPoint, Guidebook, and Four Year Curriculum Guide and Classroom License.